This project on Iroquois Ave in Long Beach is a contemporary take on a drought tolerant, water-sise landscape. 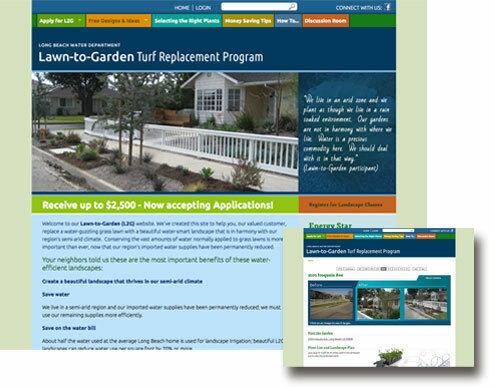 Because there is an ever-increasing push to remove lawn in the City of Long Beach (Lawn to Garden Program) as part of an environmentally conscious effort, alternative ground cover materials were utilized. Various types of decorative gravel, bark-mulch, and decomposed granite create clean lines and intriguing shapes. In this ‘out-of-the-box’ design, features that would typically be used in a backyard setting were brought to the front, such as built-in seating, and a small patio space. This project was viewd by hundreds of patrons who were eager to give positive feedback. The selection of California and Southwest native plants were the most commented upon. Plants in this landscape include Acacia Baileyana ‘Purpurea’ (parkway tree selection), Acacia Cultriformis (Knife-leaf Acacia), Cercidium ‘Desert Museum’ (Palo Verde), Stipa Tenuissima (Feather Grass), Pennisetum ‘Rubrum’ (Red Fountain Grass), Teucrium Chamaedrys (Trailing Germander), Anigozanthos Species (Kangaroo Paw), Eremophila maculata ‘Brevifolia’ (Spotted Emu Bush), Echium Fastuosum (Pride of Madeira), Senecio Mandroliscaea (Kleina), Aloe Striata (Coral Aloe), Agave Attenuata (Foxtail Agave), Echeveria ‘Afterglow’ (Afterglow Echeveria), Hesperaloe Funifera (Red Yucca), Dymondia Margaretae (Silver Carpet), Artemesia ‘David’s Choice’ (Artemesia cultivar). Hardscape selections are as follows: Built-In wood bench is reclaimed hardwood with clear glass windscreen inlay. Hard-trawled standard concrete, decomposed granite with hardening agent, 1-2 inch red rbeach pebble, 3/8 inch decorative gravel, and fine mulch as top-dressing. Systems include fully automatic sub-surface drip irrigation by Netafim. Low-voltage lighting with transformer by Vista and Focus fixtures. For completed project images, visit our Gallery Page.